Got books to digitize and plenty of patience? Amazon's Kindle Convert software will let you scan them at home. As spotted by The Ebook Reader, Kindle Convert is a $50 PC application that turns printed pages into Kindle e-books. It should work with most scanners, provided they support at least 300 dpi, 8-bit depth for greyscale, and 24-bit depth for color. 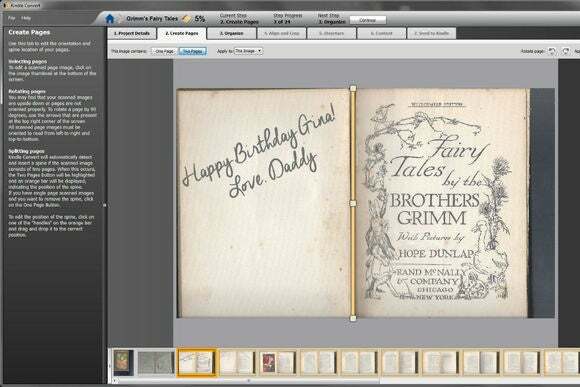 The software includes automatic alignment and text editing capabilities, but also preserves the book's original font and formatting, along with any handwritten notes, autographs and images. Once the pages are scanned, the software then saves the document in Kindle format and adds it to the user's Amazon Cloud Drive storage. From there, Amazon treats it like any other Kindle book, with features like page sync, notes, highlights and a built-in dictionary. Why this matters: The idea of turning printed text into e-book form isn't new, and you certainly don't need Amazon's software to do it. Kindle Convert merely removes some of the hassle by scanning straight to Kindle format and sending the file to the cloud. It could be a valuable time saver if you don't mind being stuck with Amazon's proprietary e-book format.